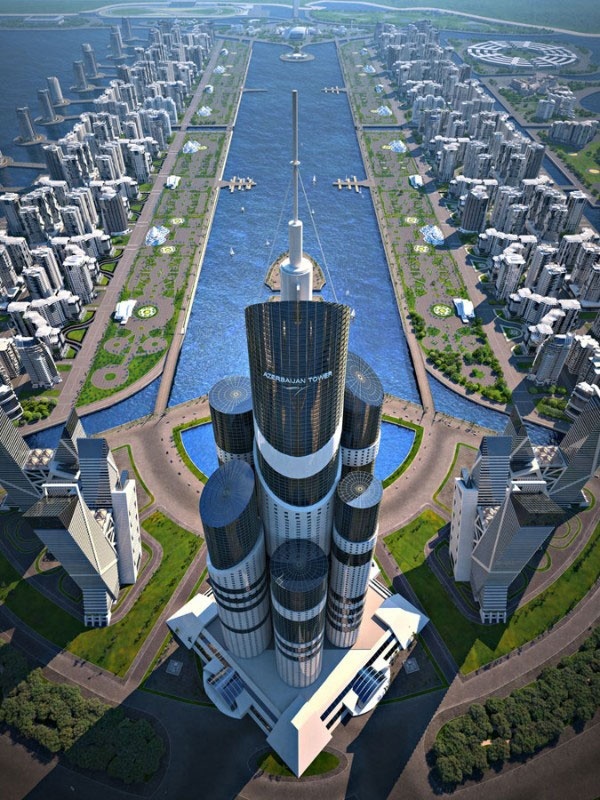 Azerbaijan Tower is a proposed supertall skyscraper to be constructed on the Khazar Islands, 25 km (16 mi) south of Baku, Azerbaijan. The president of the Avesta Group of Companies, Ibrahimov Ibrahim, stated that the Azerbaijan Tower would rise to about 1,050 m (3,445 ft) with 189 floors. The $2 billion tower is to be the centerpiece of the Khazar Islands, a $100 billion city of 41 artificial islands that will spread 3,000 hectares over the Caspian Sea. The city is being planned to house 1 million residents, contain 150 schools, 50 hospitals and daycare centers, numerous parks, shopping malls, cultural centers, university campuses, and a Formula 1 quality racetrack. All of these facilities are planned to be able to withstand up to magnitude 9.0 earthquakes. The city will be equipped with 150 bridges and a large municipal airport to connect the islands to the mainland.